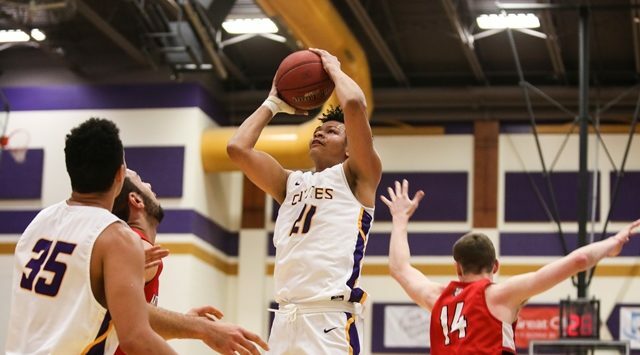 Kansas Wesleyan men’s basketball opened the week with a heartbreaking, buzzer-beating defeat at home. The Coyotes also closed out the three-game stretch with a blowout. Junior James Brooks poured in 22 points, the bench combined for 42, and the Coyotes handled the Avila Eagles, 86-51, inside Mabee Arena. KWU sprinted out to an 18-2 advantage before the Eagles could figure out what hit them. The lead would only continue to grow, jumping to 42-19 at the half. Brooks fueled the opening half with three of his five three-pointers. Avila (0-7, 0-5) tried to fight back in the second, but the Wesleyan lead would never dip below 20 points, ballooning to as large as 41 with 7:10 remaining in the game. Brooks was 7-of-8 from the field, 5-of-6 from deep in 16 minutes. Sophomore AJ Range chipped in a career-high 12 points and six rebounds. Kansas Wesleyan was 60 percent from the field while holding Avila to 30 percent. Kansas Wesleyan (4-4, 2-4 KCAC) stays at home next Wednesday when the Coyotes play Saint Mary. Tipoff is at 8 pm on FM 104.9, ksal.com and Rocking M Media app. In the previous game against Southwestern, Kansas Wesleyan put up 31 points in the opening quarter. That energy carried over into Saturday as the Coyotes built an 18-8 advantage after one. The Coyotes didn’t stop there, outscoring the Eagles 24-11 in the second stanza, taking a 42-19 lead into halftime. Kansas Wesleyan increased the margin to 31 early in the third before Avila cut the deficit down. The Eagles (3-2,-3-2) couldn’t learn from their mistakes, however, turning the ball over 26 times. Senior Kayla Kivinski scored a game-high 22 points. The Salina Ortho Player of the Game was 8-of-14 from the field while also pulling down seven rebounds. Junior Courtney Heinen added 10 off the bench. Sophomore Virja Lewis ripped down 10 rebounds, scored four points and added two steals and three blocks. KWU (6-4, 4-1) capped the week, going 3-0. The Coyotes play Saint Mary next on Wednesday. Tipoff is at 6 with pregame at 5:45 on FM 104.9, ksal.com and the Rocking M Media app.